Oxiclean Baby Stain Soaker is not found in many stores, in fact I believe Target is the only store in my area that had it in stock. I like the fact that it is free of perfumes and dyes and is a powerful stain remover. It is excellent in getting out formula and baby food stains. For clothes with a lot of stains I let them soak from 4-6 hours. If there is just 1 or 2 small stains I mix up a paste, apply it to the stain leaving it on for about 10-15 minutes, then throw it in with the rest of the wash. I have also used it to presoak adult clothing, after all it is very likely that I will need to address the same stains as the baby's, on my clothes. It seems like my washing machine is always running or is in pre soak mode! Thanks for sharing this review of Oxiclean Baby Stain Soaker Mary. I definitely know what you mean about the mess babies can leave behind, having three kids of my own. Here's an article about what I consider the top 10 baby stains, since you most likely will relate. I agree the baby and free and clear versions of this product can be harder to find in stores than the original version, but they are often readily found online, such as through the links above. 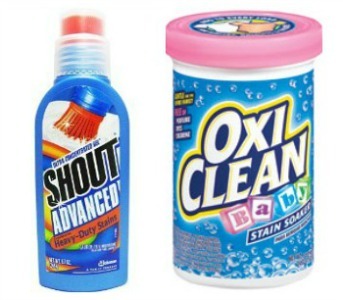 I would love to hear even more reviews of some of these specialty Oxiclean products. I have already provided my review of this product here. Further, you can share your own reviews and uses here, or read others that have already been submitted. I agree with Mary regarding the results I get using this product for soaking baby clothes. I really like the fact that it is free of perfumes and dyes. I also use the Oxiclean Baby Stain Spray for pretreating small stains if I am washing the same day the stains occurred, i.e. if presoaking is not necessary. Needless to say the Soaker is used a lot more than the spray! I also use both of these products on the adult laundry as there are times when we get the same stains on our clothes. It really helps in removing what I call "white crusty" stains on my tops, as well as the baby's. Tonya shared in a separate review why she really loves Whink Wash Away (her review is towards the bottom), since she's a daycare provider and deals with lots of kids stains. At the end she shared this separate part of a review about this product, so I've placed it here on this page instead. Some of our daycare customers like OXI Baby (made by OXI Clean) and BIZ for presoaking heavily stained baby clothes. I personally have used these products as a whitener for white garments that do not allow for chlorine bleach. In addition if I have an unusually bad week of stains from work I will also use these products to presoak clothing. 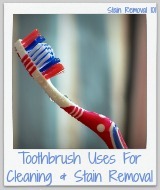 They remove both stains and odors. The combination of Oxiclean and BIZ really is an almost unbeatable combination! There's another review on the site explaining how a lady uses the original version of Oxiclean plus BIZ for stain removal, plus I've collected lots of other uses as well! Patty shared her Shout Free stain remover review here, which is a hypoallergenic and scent free product. She stated she used the Shout for small stains on baby clothes, but then she started talking about Baby Oxiclean, so I added that part of her review to this page instead. I also use the Oxi product for the rest of the family wash when needed since it is quite effective and free of perfume and dyes. While I have used the Oxi Clean Free (general product) I have found that the Oxi Baby formula works the best for baby type stains, and whatever he gets on himself sometimes winds up on our clothes as well. For baby stains on adult clothing (where presoaking is not needed but I think Shout won't complete the mission) I usually mix up a paste of the Oxi, apply it, let it sit for about 10 minutes, then wash.
We recently returned from a trip with a lot of stained laundry, including baby formula, baby food, etc. Fortunately I packed a bottle of Shout Gel (brush type) which I used to pretreat the stains as soon as I was able. This did not take up much time and I am sure it helped with the whole process. For baby stains that happen at home I generally skip the Shout and just drop the clothes into a soak bucket (with OXI Baby) right away, then dump the soak bucket into the washer when I am ready to wash a load. This method arrests the stains, as they don't have any chance to set. Since these stains from during our vacation were several days old I knew I would be presoaking them. I added one additional step to the presoak process. Before I put the clothes in for soaking I mixed up a paste of the OXI Baby and applied it to the stains. I then let them soak for about 8 hours. This is definitely the way to go for older stains, especially when there are a variety of offensive odors involved. I then washed them with Dreft detergent. The stains came out in the first washing. 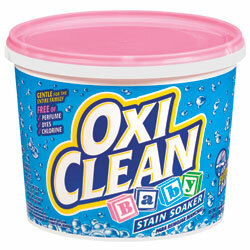 Before I discovered the OXI Baby soaker I spent a lot more time and money on the laundry. I have a range of stain makers in my house. 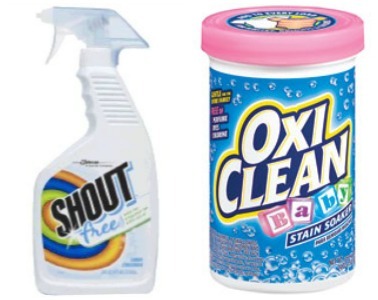 I use the Oxi Baby Stain Soaker for the baby's clothes, and use the regular powder for the older kids clothes. I also use the Baby Stain Soaker for any stains I get on my clothes from the baby if they are garments that will come in direct contact with him (my tops and robes), as the Baby Stain Soaker is free of perfumes and dyes. Both of these products are great in removing stains, ranging from baby formula, fruit juice, fruit and vegetable stains from the baby clothes, and grass, dirt, blood, etc, from the older kids clothes. 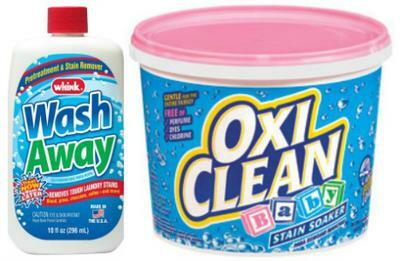 Both of these versions of Oxi Clean were recommended by the day care as they use these products daily. I highly recommend both of these products as well. P.S. My sister wears a lot of white shirts to work and uses the Oxi Clean powder as a booster for white laundry. They really do come out looking good, including the coffee stains she is bound to encounter! I pretreat baby formula and baby food stains with Whink Wash Away pretreater as soon as possible. Then the night before I run the actual wash I will throw these stained clothes into the washer with a good dose of the Oxi Baby Stain Soaker and let them soak overnight. The next morning I run the wash and it works really well for me as I can have a clean load of clothes before I leave for work. If for some reason my schedule does not accommodate this approach the Whink pretreater can be left on for several days, thus the stains do not get a chance to set. Whink also works well on coffee and tea stains I occasionally get on my shirts, along with the "more frequent" baby formula stains. Both of these products are not readily available in most of the local grocery stores. One of my co workers told me about the Whink pretreater as it was her favorite in removing baby formula when her son was young, and I learned of the special Oxi Baby Stain Soaker from the day care, as they use it to presoak and wash their uniforms. The Oxi Baby is great because it takes care of the stains and does not irritate anyone's skin. I totally agree with Terry (in the comments) that this is a great presoaker. It works miracles! I presoak all of my son's laundry. One caution for those that are new at dealing with a lot of stained baby laundry. Be sure that all of the clothing being soaked permits the use of at least non chlorine bleach. If the label reads "Do Not Bleach" do not use this product for soaking or as an additive to the wash, as it could cause fading or even damage the fibers to the point where small holes develop. So many times one may think that the term bleach only means chlorine bleach, but a general statement also includes non chlorine products as well. Fortunately most of the clothes do not have this prohibition on their garment care labels and I do not know why anyone would ever think of producing baby clothes that would have this restriction when you know that they will be stained! In my haste I managed to ruin one outfit by not paying attention to the care instructions. Sue, I totally know what you mean. I've messed up clothes before assuming that they could be washed, because who in their right mind would manufacture clothes for a baby that couldn't be washed? What I've found, just like you, is that some manufacturers choose fabrics that just aren't easily washable at home. I personally now always check care labels before I buy something and have put things back on the rack because I knew that I didn't have the time, money or patience to care for something the way it said. This is one of the most practical gifts I received at the baby shower. It was given by a mom that had lots of experience with baby stains. I am amazed at how powerful this product is at removing baby formula, food, etc. Since I have sensitive skin I always have to be careful what I use for my laundry as well, so it is really nice to be able to use this product to get out some of the same stains on my clothes. I use it mainly as a laundry pre-soak, but also as an addition to my detergent for washing, depending on how quickly the clothes are washed. Really, I can't recall a day when there were not some clothes being soaked! I now give a large box of Oxi Baby as one of my gifts at other baby showers. This is a great product for removing baby formula and food stains. Save your old toothbrushes as they come in handy for applying a cold water paste of the Oxi Baby to the stains. I find that if you work the product in really well (gently), then let it sit for 10-15 minutes before washing, you generally are successful in getting these stains out, especially if they are what I call "same day" stains. If not, then presoak overnight for best results. When my neighbor worked at a day care she said that they used this product to soak and wash their uniform smocks, etc. Typically they would soak a load overnight, then run the wash early in the morning. It saved her from having to deal with all the stains in her laundry at home. Candy also has a review of this product. A few members of our household have sensitive skin and are allergic to most laundry products. Of course being allergic to various stain removers and detergents does not mean that they are exempt from getting stains on their clothes. For this reason I always look to see what people are using to care for baby clothes, as babies have very sensitive skin. The OxiClean Baby Stain Soaker is my choice when it comes to handling stains. It is a terrific presoaker as well as additive to the wash load. I have used it on grass, blood, fruit, and tomato based stains with great success. It is also a plus for keeping my white laundry from becoming dingy over time and is especially helpful when washing a load of white shirts. Thanks so much for sharing your experiences with this presoaker with me Candy. You're absolutely right that this a great choice for those with sensitive skin, since it is both scent and dye free. If you've got sensitive skin I definitely recommend people use only hypoallergenic laundry supplies, not just the detergent but all the products! I'd love to hear from even more people who've used this, or any other stain removal product. 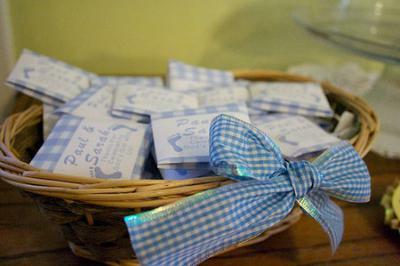 You can share your stain remover review here, or read lots of laundry stain remover reviews here. I have tried several different presoak products for baby stains and can only say this is the best one I have found. It works well even on baby formula stains, not to discount the number of food stains it has gotten out. I always buy the liquid Baby Oxyclean to spray on my kids clothes. Has anyone had any luck in mixing the powder into a spray bottle??? I generally pretreat baby formula and food stains with Shout Gel. Then when I have a enough to wash a load I presoak with a 50/50 mix of the Oxi Clean Baby and Biz for several hours, sometimes overnight. Then I wash with All Free Clear detergent. I tried a number of different approaches in getting out these types of stains, but so far this is the best one. I use the same method when I acquire the same stains on some of my clothes as well. If I didn't, I probably would have a dozen tops I could no longer wear in public! I have used oxiclean for years. About a year ago rust stains appeared on light colored wash. I use a lot, about 4 large scoops. Husband does not get this problem and uses much less oxiclean. We buy whatever Cosco has. I am going to try the "free" or "baby" oxiclean after reading the comments on this site. 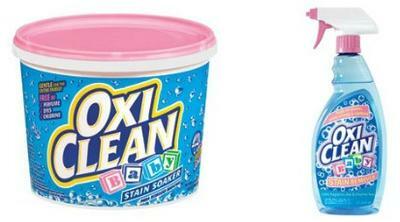 I use the Oxi Baby Stain Soaker to presoak and wash my son's clothes. It is great at removing all kinds of food and formula stains,and the sour smells. It also works well on blood stains. I have sensitive skin and of course my son spits up equally on my old sweat shirts as well as my occasionally worn good blouses. Thus I use this product for my clothes as well. While laundry is now a real chore presoaking really makes it much easier and there are not many products around that have not caused allergic reactions for me. Although Kroger carries it I usually purchase it at Target since it is cheaper. Target has a great selection of laundry supplies. Getting Out Baby Food, Formula, etc. The best advice I received in removing baby food, formula, etc. is to use the Oxiclean Baby stain soaker and pre soak everything. This product really works well. I just use soak buckets and empty them into the washer when I have enough to do a load. Since some of the same stains land on my clothes I also use it for them as well. Some stores don't carry it at all, and some carry only the smaller size but Target usually has the large size in stock. I always get the large size because it is my most used laundry item. I highly recommend this product for baby stains.